You have spent hours or even weeks putting together a detailed estimate. You have presented a proposal to your customer listing out detailed job specifications by category of work with a total price. The customer signs it. Now the work begins. The problem is, you need to communicate what was sold to your customer to the vendors and employees working on the project. One method of communication is the telephone game. We’ve all played the telephone game; the kindergarten game where your teacher sat you and the other students around in a circle and told you a story and you told that story to the person next to you and that person told the person next to them and so on. Once the story got back to you the story was completely different. Today, there are contractors and vendors still playing the telephone game. They’re still communicating verbally with their vendors and internal personnel. These are the same companies wondering why the wrong materials are being delivered, completion dates are not being met and their accounting people are still overpaying or double paying vendors. We all want to make sure the job flows smoothly because we all know mistakes in communication costs us time, money and can very well create unhappy customers. To get away from the telephone game many contractors are incorporating automated purchase order management systems in their business to communicate more effectively with everyone involved in the construction process. 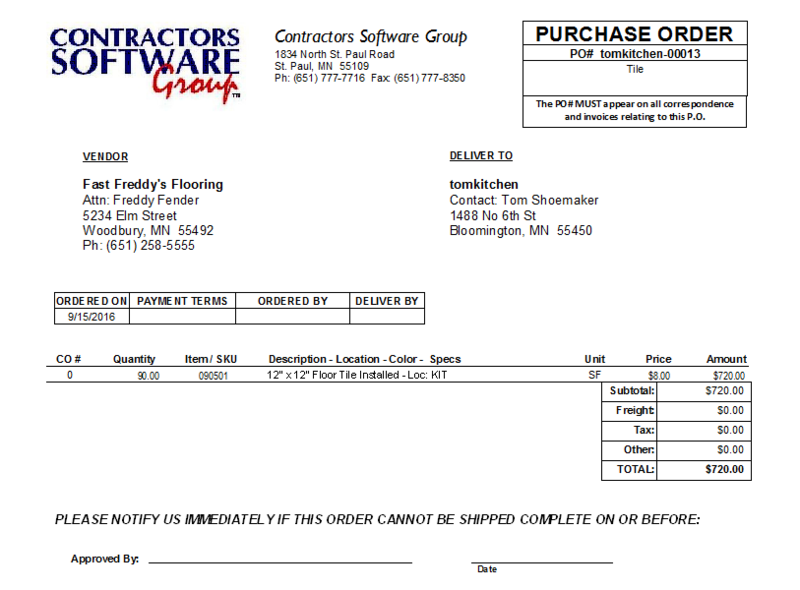 Purchase order management systems have been around for years to communicate more effectively. In the last few years, technology and construction software developers like Contractors Software Group, Inc. (CSG) have made such systems faster, better and quicker. The next process in a purchase order management system is to provide the purchase orders to the field personnel for approval. The purpose of involving field personnel is to ensure they are clear on who is providing products and services to the job. Now the vendor and the field personnel are referencing the same information. With this process, the field personnel are responsible and accountable for receiving the correct materials and approving work performed. This process is saving contractors thousands of dollars in mistakes. With the use of wireless laptops, 4G cards and CSG’s Field PO Approval module field personnel can approve purchase orders remotely in the field. By automating the PO approval process reduces the need for field personnel to come into the office and shuffle paper. Once the purchase orders have been approved by the field the final process in a purchase order management system is the invoice/payment approval process. This is where you match the purchase order with the vendor’s invoice. As long as the vendor’s invoice matches the purchase order and the field approves the purchase order, the invoice is okay to process. The benefit of this procedure is eliminating the chance of paying for undelivered material or unfinished work. It also eliminates the chance of overpaying or double paying vendors. The procedure reduces invoice posting errors in your job cost and financial accounting because the purchase order knows what job and category of work the invoices are to be posted to. Some contractors are even getting away from entering invoices altogether by creating the invoice from the purchase orders once the work is approved by the field. With the latest in technology, thousands of contractors benefit from the use of purchase order management systems to control costs, communicate more effectively and to make more money. They are turning to construction software developers like Contractors Software Group, Inc. who incorporate these successful processes and procedures into their products. In today’s economy, CSG’ systems will help you do more with less. To find out how you can save time, money and communicate more effectively with CSG products, please go to www.contractorssoftwaregroup.com or call 1-800-866-3083.